Do your children like to pretend they're secret agents? You can enhance their play with the Spy Gear Ultimate Spy Watch. The Spy Watch functions as a standard watch, but includes many accessories that bring imaginations to life. Included with the watch are a secret message decoder screen, a recordable motion sensor and an LED spotlight. The accessories are easy to use and safe for children 6 and older. 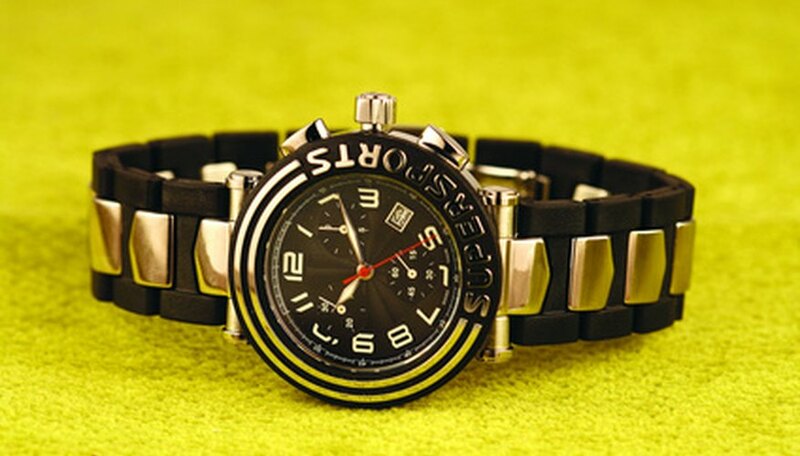 The Ultimate Spy Watch has several functions, but the main function is the watch. Setting the time and date is done with two push buttons on the right of the watch face and one push button on the left side of the watch face. To set the time and date, press and hold the "Mode" button on the right side until the hours unit starts blinking. Increase the number by pressing the "Sensor" button on the left and decrease the number by pressing the "Set" button on the right. Once the hour is set, press the "Mode" button to switch to the minutes unit, which will start blinking. Use the same two buttons to increase or decrease the minutes. Continue in this manner to adjust the seconds, year, month and day units. If you let the watch sit for five seconds, the watch will exit the setup mode and return to normal time display mode. If you need to enable or disable daylight saving time, press and hold the "Set" button for two seconds. The motion alarm feature records times when the Ultimate Spy Watch is moved. For kids looking to be spies, this feature could help them catch anyone in the act of touching their things or going into their room. When set, the motion alarm sets off a noise and records the time when a watch is moved. To set the motion alarm, press and hold the "Sensor" button on the left of the watch face. When the sensor icon appears on the display, attach the watch to anything you want to monitor. For example, if your kid thinks someone is rifling through his book bag, he can wrap the watch around the bag. When the watch is moved, it will set off an alarm and record the time of the movement. You can review the times recorded on the watch by pressing the "Mode" button on the right of the watch face. Exit the motion alarm mode by pressing and holding the "Sensor" button. The Ultimate Spy Watch has other features to assist kids in their spying endeavors. The decoder screen works with special paper supplied with the watch. Write a message on the paper in pencil. The paper will look as if it does not have any writing on it until you look at it through the decoder screen on the watch. The LED spotlight is operated by pressing the "Light" button on the lower part of the watch face. Be careful not to shine the light in your eyes as it may cause injury. Finally, two small capsules attached to the watchband can be used to store messages. Remove a capsule from the watchband and twist it to open. Place the message in the capsule and close it by twisting the top back on.